LOVE-IN is now available on DVD - Buy now! Watch for Love-In on your local PBS station! 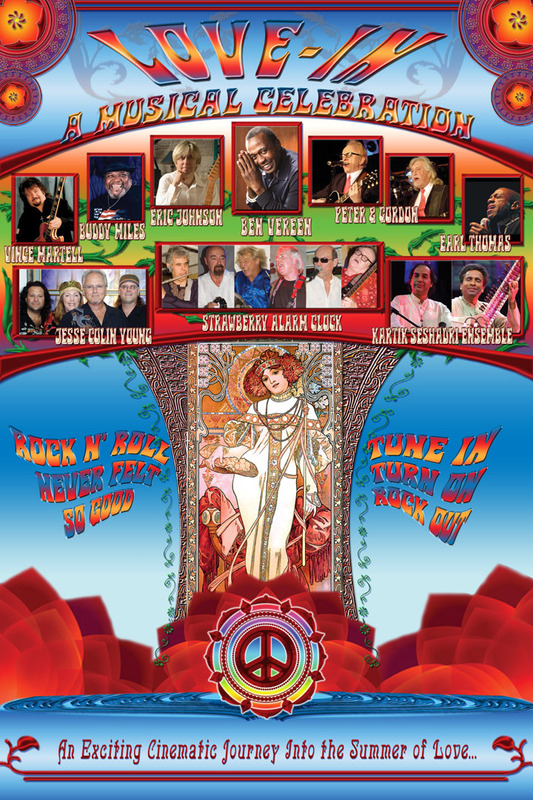 LOVE-IN is a theatrical celebration of the Summer of Love, featuring legendary artists and a spectacular psychedelic light show. Tony Award-winning Broadway star, Ben Vereen, is your guide on a journey to that explosive, socially and musically influential time. Guest Artists include Grammy Award-winning guitarist, Eric Johnson, ‘60’s British Invasion greats, Peter & Gordon, founder of the Youngbloods, Jesse Colin Young, singer and world renowned drummer for Electric Flag and Jimi Hendrix, Buddy Miles, lead guitarist from progressive rock pioneers, Vanilla Fudge, Vince Martell, the legendary psychedelic band, Strawberry Alarm Clock, soul and blues singer, Earl Thomas and sitar virtuoso Kartik Seshadri, the foremost disciple of Ravi Shankar, accompanied by tabla master, Arup Chattopadhyay. The Love-In Band includes Musical Director, Doug Robinson, classic rock group, Rockola, actor/ singer/ musician Jon Walmsley, multi-instrumentalist, Tripp Sprague and vocalist, Peg Pearl. The world premiere debuted to sold-out audiences at the Birch North Park Theatre in San Diego, CA. Adams Entertainment filmed the performances. Love-In is currently airing on PBS stations nationwide.